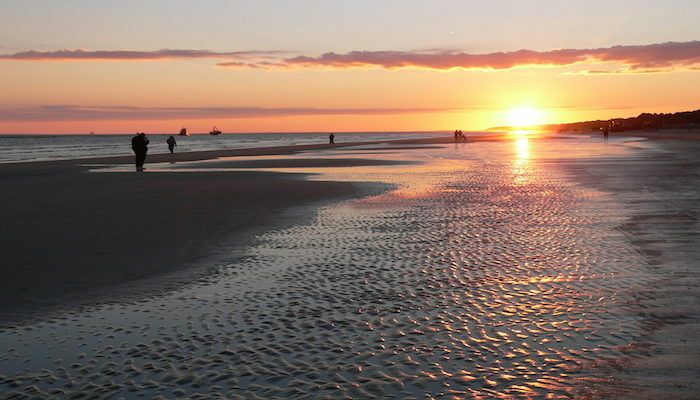 The beaches on Hilton Head Island are among the best for running in the southeastern United States. Nearly 12 miles of continuous beach, much of it very wide, and with hard, packed sand much of the way and most of the day. As we’ve mentioned, much of the land on Hilton Head is privately owned, and while the beach itself is public, it’s helpful to know the access points. Among the easier ones are Coligny, Driessen, Folly Field and Islander Beaches. We don’t proscribe a particular place for running, but basically point out that there’s 11+ miles from Islander Beach Park, south to Land’s End in Sea Pines. There can be great sunsets toward the southern end at the sound. See the link below for information on the different beaches and markers. One interesting aspect for runners: Along the beach you will see numbered markers which have been put in place to help identify the location to emergency responders. The numbers start at “one“ on the Calibogue beach at Lands End in Sea Pines plantation and increment by one every tenth of a mile as you go North or East. Numbers ending in “A” “B” or “C” designate a location between the two numbers on either side and are not indicative of miles. When the tide is high, there is still a good beach from approximately beach marker 80A to Tower Beach in Sea Pines, at beach marker 13 and even as far as marker 8, and also from marker 102 to 111A. Depending on how high the tide is and when the last beach renourishment took place, other locations may prove unusable at high tide.